A Perseid meteor showers event at Newport State Park in WI. Ray was leading the effort for Newport to gain Dark Sky status. Photo courtesy of Dennis Moutray. IDA staff and board members are truly saddened to learn about the passing of Ray Stonecipher of Sturgeon Bay, Wisconsin, a passionate and dedicated advocate for dark skies, last Thursday, August 27. 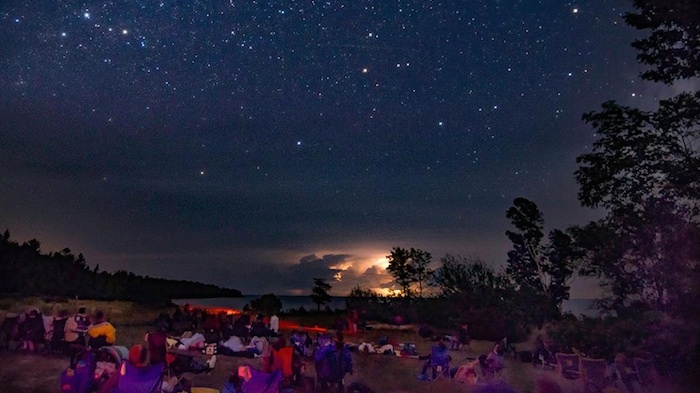 Ray, an IDA member since 1990, was a driving force behind current efforts to get Newport State Park, near the tip of the Door County Peninsula in Wisconsin, designated an International Dark Sky Park. He was leading the charge until this past June when his health declined and he had to step down. Ray organized a small working group to complete the IDA application and thanks to Ray’s dedication, a complete draft of the park’s application was recently submitted to IDA. Ray was not just a leader in these efforts, he was also out in the field making sky brightness measurements. A retired UW-Whitewater professor of astronomy, Ray was also instrumental in forming the Door Peninsula Astronomical Society. He and his wife Ruthie created the Ray and Ruthie Stonecipher Astronomy Center, now in use by thousands of students and visitors. Ray will be sorely missed, but the legacy of his work to protect Wisconsin’s dark skies endures. Our hearts go out to his friends and family.